Last week the library co-sponsored, with the Irish Studies program, a series of Irish culture events in celebration of St. Patrick’s Day. The three event sequence covered Irish dance, sport and song, and featured presentations by Fullbright scholar and Foreign Language Teaching Assistant (FLTA) Gearóid Ó Duinn. Professor Ó Duinn teaches Irish Language in Villanova’s Irish Studies program. The first event began with a primer on greetings in the Irish Language. Professor Ó Duinn helped the audience as they exchanged salutations of “Dia duit!” (Hello!) and “Dia is Muire duit” (God bless you), and identified various words in English which derive from the Irish language. The second half of the presentation covered Irish dance, traditional and contemporary, including historical background on forms such as Ceili dancing and Sean-Nos. The second event, hosted on March 21, focused on Irish sport. Professor Ó Duinn described Gaelic Football and Hurling, two exciting sports remote to many of the Villanova community members in attendance. After the presentation, Ó Duinn invited the audience to join his Irish Language class in a Hurling tutorial on Mendel field. 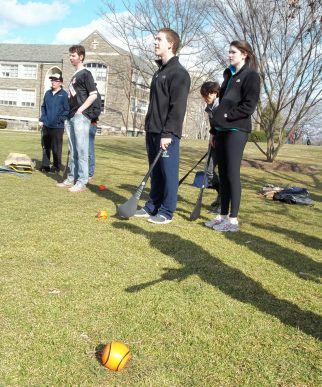 Just outside the library, students practiced basic handling with their hurleys and the sliotar, and even tried their hands at a scrimmage game, despite the high winds. The final event in the Irish Culture sequence was a presentation of Irish song. 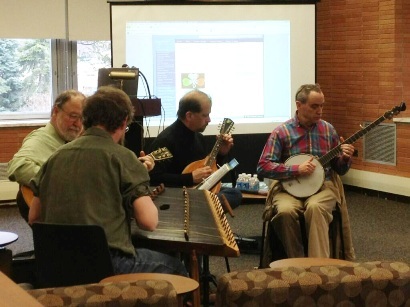 Attendees were lucky enough to see live music performed in the library, a moment captured in an audio recording from the event. The band included members of the Villanova faculty. All events were held in the Speakers’ Corner on the first floor of the library and were free and open to the public. Laura Bang is a curatorial assistant with Special and Digital Collections.